It was 1998 when I first became aware that the clouds above my home in the San Juan Islands were changing. The formations that I had enjoyed since childhood, often subjects of the looks-like game, were mostly gone. Gone were the giant cotton turtles, faces, mountains and camels. The clouds of my dreams had been replaced by long, thick, ugly white streaks that bore no resemblance to those of my youth. These new clouds would send out long streamers at right angles to the main bodies, eventually reaching from horizon to horizon. Layer upon layer of these pseudo clouds would appear, cris-crossing each other in grids until the sky was obscured by thick gray blankets. Mystified and curious, I began keeping a close watch on this phenomena, and taking plenty of pictures. In early 1999 I witnessed the makers of these fake clouds and got a look at the vehicles responsible for creating them. Beyond a shadow of a doubt – these pseudo cloud formations were man made! I was shocked by what I was witnessing, the implications surrounding these mysterious events being as disturbing as the chemtrails themselves. It was an early spring morning. While driving south on Cattle Point Road to a business appointment, I was startled as something big flew overhead. The shadow passed over my car as a thunderous rumble rocked the island.Pulling over, I got out and looked up to see a mysterious white tanker plane (C-130) banking steeply, pulling a tight donut in the air, as thick white streamers exuded from the wings. The plane, like those used to refuel others in mid-flight, had just flown over our island at low altitude. As it came by for the second pass I saw that the white plumes were not coming from the craft’s engines, but from rows of nozzles on each wing. 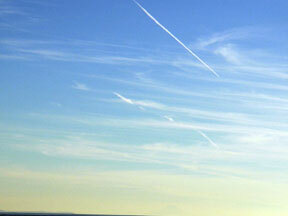 The pilot was spraying unknown substances into the air above our pristine island home. Why this was being done then and now is an official mystery. For the rest of that day I monitored the strange clouds the tanker plane had produced, observing the changes in their aerial formations. 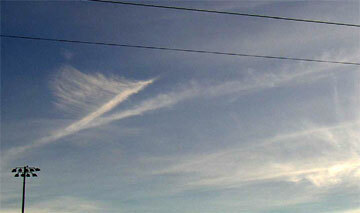 Unlike ordinary jet contrails which dissipated within minutes, these ‘chemtrails’ continued to grow for hours. By the end of the day, what had been a clear blue sky in the morning, was transformed into a nearly opaque blanket of man made cloud cover. There were no ‘natural’ clouds present – only man made ones. This event in early 1999 marked the beginning of my quest for answers to this mysterious weather modification program. Now, four years later, many of my original questions remain unanswered. The secrecy surrounding this global chemtrail program is exceeded only by the denial of the authorities. To this day the official position on Chemtrails is that they don’t exist, despite the fact that anyone using the powers of observation can look up and see their creation on a daily basis. These sickly looking clouds appear in most outdoor TV commercials, movies and news reports. The fact that this easily observable phenomena exists below the level of public awareness is one of it’s most intriguing and disturbing aspects. 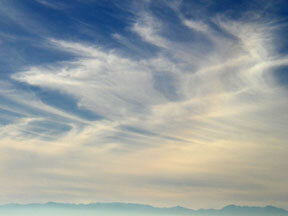 Over my home in the San Juan Islands of Washington State, chemtrail spraying is a daily occurrence. In the past six months these operations have settled into four to seven day cycles. On the first clear day after a NW rainstorm, the planes arrive early in the morning, flying repeatedly north and south between the Olympic Peninsula of WA and Vancouver Island, BC. When a sufficient bank of chemtrail spray has been created, the planes will start flying east and west laying out a non-uniform grid. As prevailing winds carry the bank of suspended aerosol eastward, the planes continue to stitch up large open areas. By the end of the day there is usually a heavy, opaque cover of man-made clouds. On day two of the spray cycle, the planes repeat the previous days pattern, but at a higher altitude. This layering technique is repeated for two to five days until an advancing weather front hits the area, dumping large quantities of precipitation. As the Pacific NW is experiencing the second year of severe drought, one wonders if these mysterious spraying operations are involved with the atypical weather patterns. Are they suppressing rain, creating it or otherwise modifying it? During the spraying cycles many individuals experience bronchial distress, heart palpitations, asthma and other alarming symptoms. Upper respiratory illnesses, asthma, sinusitis, and allergies have dramatically increased here in the Pacific NW – previously a preferred environment for individuals with these conditions. Another common ailment is short term memory loss, affecting even the very young. So what is really going on here? Many individuals within the government must know about this mysterious global atmospheric modification program. After all – they have labored day and night ridiculing, debunking and suppressing public knowledge of it. Even though Air Force generals brag about these new capabilities, even though chemtrails were mentioned in a Senate resolution proposal the banning ‘exotic atmospheric weaponry’, this program exists below the threshold of public perception. Somewhere between the denial from governmental sources and the far-out conspiracies must be someone who knows what this program is all about and is willing to talk about it. Brian Holmes of holmestead.ca has apparently made contact with an anonymous chemtrail insider, whom he has given the pesudenym ‘Deep Shield.’ This shadowy insider has detailed and intimate knowledge of this mysterious aerial program known as the ‘Operation Cloverleaf’. During this extensive correspondence, Brian had opportunities to ask specific questions relating to the aerial spraying. The answers are revealing and startling. In these emails Deep Shield’ explains that this massive covert chemtrails operation is actually an internationally coordinated program aimed at correcting severe damage to the atmosphere inflicted by humanities excesses. After carefully scrutinizing this correspondence, I have concluded that it is most likely genuine, and does answer many of the questions that we have been asking for years. There are further reasons that I believe that this information is genuine and accurate. Several years ago a report leaked from very high levels of the U.S. government indicated that Earth’s multiple and intertwined ecosystems were in a state of accelerating collapse. I read this report. It stated that all life on our home planet would be extinct within 20-30 years unless drastic measures were taken. This information has been intentionally withheld from the citizens of Earth, as widespread panic would occur if the truth was known. This was a problem that our greatest minds and governmental bodies have wrestled with. Nearly every nation participates by supplying materials, equipment, planes and pilots according to ‘Deep Shield’. The planes are unmarked, white, light gray or sky blue. These do not show up on air traffic control radar systems. Planes of this description are known to be used in Special Ops – shadow operations. So what can the ordinary person do about this? It is this authors opinion that caution should be exercised during spraying operations. Look up often. Learn to identify the artificially produced clouds and haze. When these programs are underway, outdoor exercise and work should be delayed. If you must be outside wear a good quality air filtration face mask. Many have discovered that staying inside during the first few days of spraying is a good idea. Children, elderly and those with respiratory ailments should refrain from outdoor activity. If you have an air filtration system at home or at work, run it! 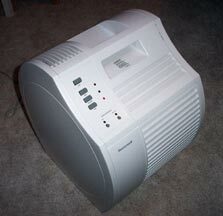 Running a HEPA air filtration system is a necessityfor maintaining interior air quality. It also serves a dual purpose in the event of a biological or chemical attack. Don’t scrimp when purchasing such a system, make sure that it removes fumes as well as particles. ‘Whirlpool Whisperpure, and Honeywell Quietcare’ systems are top rated. Make sure the models you choose remove fumes as well as particles. If you have a forced air heating system, replace fiberglass filters with electrostatic filters from 3M or AllergyPro. These remove 7-8 times the contaminates of ordinary filters. Drink plenty of pure water to help excrete the toxins. When the symptoms of chemtrail exposure become severe, consider a cleansing program such as ‘Arise and Shine.’ Cleansing programs and juice fasts help the body dump large amounts of toxins quickly. For exercise during spraying days, do so inside with the air filters running. We recently bought a mini-tramp for this purpose. As chemtrail spraying is now underway in the skies above nearly every country on earth, these mysterious programs would appear to have passed from the realm of radical experimentation into that of global policy. It is obvious that our leaders are playing God with our atmosphere. One wonders at the long term dangers of this bold program. How dire were the projected scenarios to have prompted them to attempt such dangerous and extreme measures. Were there no other alternatives to the dumping of poisonous materials into the air that we all breath? Why did they not attempt replacing polluting energy sources such as oil and coal, with green energy from wind, solar, hydrogen, geothermal and hydro? With oil barons in charge of the world this not a possibility as they will do anything to retain their death grip on profits and power. This writer, for one, would prefer to have been informed about the theories that prompted these actions. Then appropriate measures could have been taken to minimize the deleterious effects of these toxic chemicals and compounds being added into our air in such staggering quantities. Of course the mainstream media will continue to ignore our small voices in the wilderness as we continue pointing out the strangeness above our heads. But this won’t stop our observations, documentation and alternative media features. 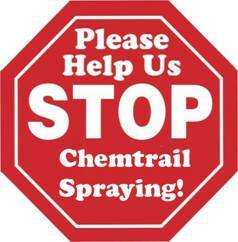 Chemtrails reports have been in the national and international media with increasing frequency lately. The following are a few of the many.